I’m loving my life right about now. Ok, so it’s pretty good all the time. But today my friends at Stewart sent me a great feast to check out and review. And boy, does it smell tasty! 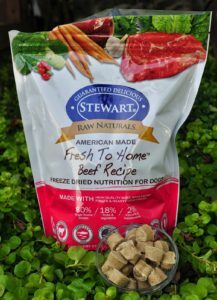 They sent me my very own Raw Naturals by Stewart Freeze Dried Dog Food-Beef! Oh, yeah – that’s what I’m talking about! It’s time for a recap for those new to my blog and feeding your dog raw dog food. Here’s Mom’s conversation about guidelines with our veterinarian food therapist, Dr. Judy Morgan. I normally eat a home-cooked, primarily organic diet, so this is a bit of a change. Dr. Morgan believes the ingredients in Raw Naturals by Stewart Freeze Dried Dog Food-Beef are along the same lines I’m used to, and she didn’t think the fact that it was a raw diet would bother me. She just wanted to confirm that Mom would continue to give me my regular probiotics and supplements. You also want to remember raw food is like handling raw meat (it is the same thing after all), so you need to wash your hands and your dog bowl after eating. Ok, now that that is out of the way. Back to Stewart freeze dried dog foods. After Mom had read the instructions on the bag of Stewart Freeze Dried Dog Food, she realized feeding instructions were a bit different than what she’s been used to. 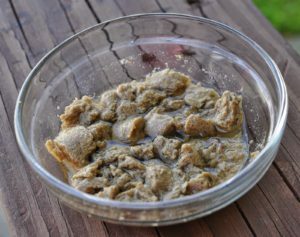 Instead of mixing the freeze-dried beef with water, this freeze dried dog food was ready to eat as-is. That sounded good to me. The faster I can taste it, the better. Mom started, of course, by offering me one piece of Stewart Freeze Dried Dog Food at a time. She sure does like to take her time about feeding me during my dog food reviews. Oh, but when I was finally able to wrap my mouth around this delight, it was worth the wait. The soft, crunchy texture was very nice. Not bad at all for a healthy dog food! After a few tastes, Mom put my portion into my dog bowl for me to eat like a real dog. Yum! Because Mom and I travel a lot out of town, we are always looking for an alternative, healthy ways to eat on the go. Raw Naturals by Stewart Freeze Dried Dog Food would be a great option. A bonus is that it is ready to eat, no water needed. However, we did try to add water to see what it did. It absorbed the water and got a bit softer, but wasn’t like a “stew,” so we’ll stick to feeding as instructed. It’s now time to check out what makes Raw Naturals by Stewart Freeze Dried Dog Food a healthy food choice for dogs. Stewart freeze-dried dog foods are grain and gluten free, complete and balanced for all life stages, contain all human-grade ingredients, are produced in the USA and SOURCED in the USA or New Zealand (lamb), have no added preservatives, are rich in antioxidants, and are prepared with whole meat, fruits, vegetables, and other natural ingredients. Stewart’s raw diet uses high-pressure processing (HPP), a cold processing technique in which food is subjected to high levels of hydrostatic pressure. This non-thermal pasteurization process inactivates the growth and function of most bacteria that cause spoilage as well as pathogenic microorganisms such as listeria and salmonella. Now that’s some healthy dog food! 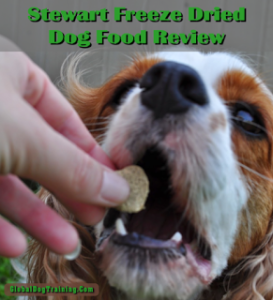 Raw Naturals by Stewart Freeze Dried Dog Food-Beef oh yes! Paws up! Thank you so much, Stewart, for allowing me to try your great beef freeze dried formula.